The production of licorice starts with mixing all components to the required mass or slurry. The mixed batches from the two batch mixers are pumped into the day tank. Because extrusion is a continuous process a day tank is needed! A slurry pump will pump the mass through a filter station into the extruder feed opening or Surface Scraped Heat Exchanger. 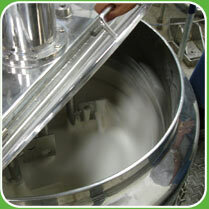 Our equipment is specially designed for a constant delivery of slurry of the required quality to the extruder or SSHE. The mass preparation is very important for the quality of processing and product. Our mass preparation system gives your production the best starting point!